Mark Chalos, Managing Partner of the Nashville office of the national plaintiffs’ law firm Lieff Cabraser Heimann & Bernstein, LLP, and Jonathan Taylor of Taylor & Knight, GP, announce that Scott County, Tennessee, has filed a lawsuit against prescription opioid manufacturers and distributors to recover taxpayer money spent combatting the opioid epidemic wreaking havoc on the Scott County community. The complaint, which was filed in Tennessee federal court, alleges that the named opioid drug manufacturers and distributors and their agents deliberately and repeatedly violated state and federal laws by widely and falsely promoting highly addictive opioids as safe and necessary, all the while concealing the true risks of the drugs. The complaint also alleges that defendants conspired to manufacture and distribute millions of doses of highly addictive opioids, knowing that they were being trafficked and used for illicit purposes, and recklessly disregarded their devastating effect on the taxpayers and government of Scott County. As a result of the manufacturers’ and distributers’ conduct, Scott County taxpayers have spent hundreds of thousands of dollars to fight the opioid crisis and to address the devastating effects on their community. “Tax payers in Tennessee have paid more than their fair share to fight the opioids catastrophe created by the multi-billion dollar opioids industry; it’s time the industry paid its fair share,” stated Chalos. “Seeking to hold wrongdoers accountable in federal court is the most effective way to make sure that Scott County has a seat at the table for the discussion about recovering tax payer money and finding long-term solutions to the opioids crisis,” Chalos said. The named Defendants include Purdue Pharma, Cephalon, Teva Pharmaceutical, Johnson & Johnson, Janssen Pharmaceuticals, Noramco Inc., Ortho-McNeil-Janssen Pharmaceuticals, Endo Health Solutions, Mallinckrodt, Allergan, Actavis, Watson Pharmaceuticals, Insys Therapeutics, AmerisourceBergen Drug Corporation, Cardinal Health, McKesson Corporation, and additional affiliated businesses and entities. Formed in 1849, Scott County has a long history of contributions to America. The County is best known for having seceded from Tennessee in protest of the State’s decision to join the Confederacy during the Civil War, and subsequently forming the Free and Independent State of Scott in 1861. The late Senator Howard Baker, Jr. (1925-2014) is Scott County’s most famous citizen. Known as the “Great Conciliator” in Washington D.C., Senator Baker was the first Republican Senator from Tennessee since Reconstruction, and became the standard-bearer for moderate Republicans. Today, Scott County finds itself at the center of an endless battle to protect all its residents, including its next generation of leaders and citizens, from the opioid epidemic that is taking a daily, deadly toll in Scott County, and counties across the nation. Scott County alleges claims for racketeering, conspiracy, mail and wire fraud, public nuisance, negligence, and unjust enrichment, and seeks all legal and equitable relief as allowed by law under the federal Racketeer Influenced and Corrupt Organizations Act (“RICO”) and Tennessee statutory and common law. The Complaint seeks repayment of costs associated with the opioid epidemic in Scott County, including actual damages, treble damages, equitable relief, forfeiture as deemed proper by the Court, attorney’s fees and all costs and expenses of suit and pre- and post-judgment interest. Recognized as “one of the nation’s premier plaintiffs’ firms” by The American Lawyer and as a “Plaintiffs’ Powerhouse” by Law360, Lieff Cabraser Heimann & Bernstein, LLP is a 70-plus attorney law firm with offices in San Francisco, New York, Nashville, and Seattle. Lieff Cabraser has filed similar cases on behalf of Metropolitan Government of Nashville and Davidson County (Nashville) and Smith County, Tennessee, and represents other counties and cities within Tennessee and outside of Tennessee in opioids-related litigation. Our firm has successfully represented tens of thousands of injured individuals in complex and mass tort litigation, and thousands of patients across America in individual lawsuits over the injuries they suffered from defective prescription drugs. Five times in the last seven years, U.S. News and Best Lawyershave named Lieff Cabraser as their “Law Firm of the Year” for representing plaintiffs in class actions and mass torts. Recognized as one of the “Best Law Firms in Tennessee” by the U.S. News & World Report and Best Lawyers, Taylor & Knight, GP is a comprehensive litigation firm based in Knoxville, Tennessee that concentrates on trial and appellate practice in state and federal court, as well as administrative and mediation proceedings. A substantial portion of Taylor & Knight’s practice is devoted to representing governmental entities such as counties, municipalities, school districts, sheriff’s departments, emergency medical services, and utility districts as well as those entities’ employees, managers, controlling boards, bodies and officials in all areas of governmental liability across East Tennessee. More specifically, Taylor & Knight has had the distinct privilege and honor of successfully defending Scott County, Tennessee and its employees and elected officials in a number of important lawsuits in state and federal courts over the last decade. HUNTSVILLE, Tenn. (July 12, 2017) — A water bottle filling station is being purchased for each of Scott County’s nine schools, as well as the Boys & Girls Club of the Cumberland Plateau, the Industrial Development Board of Scott County and the Scott County Chamber of Commerce announced today. The purchases are being funded by grant money through the Tennessee Three Star Community program, which will also be used to purchase each student in Scott County a reusable water bottle. Swann heralded the teamwork at the municipal level that helped make the Three Star grant application successful. She credited Scott County Mayor Dale Purdue, Huntsville Mayor Dennis Jeffers, Oneida Mayor Jack E. Lay and Winfield Mayor David Cecil for their cooperation throughout the grant process. The IDB and the Chamber of Commerce were tasked with completing the extensive legwork required for Scott County to receive recertification as a Three Star community. Water bottle filling stations have become a must-have in public schools in recent years, but tight budgets prevent many schools from making those purchases. Two years ago, parents teamed up to raise funding for a filling station at one local school, but most local schools remain without the filling stations. Benefits of the water bottle filling stations include providing free water for students whose parents cannot afford to supply them with bottled water, reducing the amount of plastic bottles that are disposed of in landfills and reducing sickness in schools. Traditional water fountains are germ magnets, with the mouths of dozens or even hundreds of students coming into contact with the same metal surface in a single day. Tennessee’s Three Star program requires successful communities to develop and implement strategic plans that focus on five areas: jobs and economic development, fiscal strength and efficient government, public safety, education and workforce development, and health and welfare. The program is administered by the Tennessee Department of Economic & Community Development. Appalachia Service Project (ASP) is a Christian ministry open to all people, that inspires hope and service through volunteer home repair in Central Appalachia. ASP will repair homes free of charge again this summer for Scott County families in need. Using volunteer labor and the leadership of summer staff, ASP hopes to work for 12 or more families in the area- so take action to apply now. Appalachia Service Project will be working actively in Scott County from mid-June through late July. All applications submitted throughout the year will be evaluated by ASP Staff, and candidates will selected based on scale of the projects, skill level needed from volunteers, ASP’s budget, and safety of the work site. Types of projects include porches, wheelchair ramps, foundations, insulation, roof replacement or repair, weatherization, new doors, and more. The goal of the ASP summer program is to help make homes warmer, safer, and drier across 30 counties in Central Appalachia. The Home Repair application can be found online at asphome.org/apply, and can also be found and left at the following locations for Scott County residents: Morgan Scott Project, 1022 Old Deer Lodge Pike, Deer Lodge; and Appalachian Ministry Center, 24728 Scott Highway, Winfield. You can also request an application by calling ASP Headquarters at (423) 854-8800, and send it to Appalachia Service Project, 4523 Bristol Highway, Johnson City, TN 37601. To be considered for this summer’s ASP Home Repair Program, residents must complete the application and return it by June 1 to any of the above locations. After June 1st, applications should be returned to the ASP staff at Winfield Elementary School. Since its founding in 1969, ASP has repaired more than 16,693 homes throughout Central Appalachian Kentucky, Tennessee, Virginia, North Carolina, and West Virginia through the hard work of more than 358,216 volunteers from across the nation. ONEIDA, Tenn. — Big South Fork National River and Recreation Area will be hosting the 17th annual Spring Planting and Music Festival on Saturday, April 29, near the Bandy Creek Visitor Center. The festival celebrates the coming of spring and the Appalachian way of life that has been such an important part of the history of the Big South Fork area. The plowing and planting with mule and horse teams, which take place in a field adjacent to a carefully preserved Upper Cumberland farmstead, is one of the primary focal points of the event. At the same farmstead, the public will have the opportunity to gain new insights into gardening and get their hands dirty as they learn to plant a range of garden vegetables. Visitors will also have the chance to experience close at hand forgotten arts such as blacksmithing, horseshoe making, split rail fencing, quilting, embroidery, marble making, woodworking, farmstead skills and trapping. Toe-tapping mountain music will be performed throughout the event area by an array of skilled musicians, and the main stage will feature nonstop music from some of the region’s most gifted musical talents. The young and young at heart will have the opportunity to play with a wide variety of old fashioned toys. Park staff and volunteers will also be providing a variety of programs that celebrate the coming of spring, including a guided bird walk at 8:00 a.m. (ET), programs on owls and hawks, and a guided wildflower hike at Leatherwood Ford at 11:00 a.m. In cooperation with the Knoxville Track Club, the park will be hosting a Kids Fun Run at 9 a.m., and the Oscar Blevins four mile and seven mile Trail Runs at 10:00 a.m. to help visitors actively participate in this season when the world is full of movement (sign up at https://runsignup.com). Visitors are encouraged to join park staff and volunteers in a celebration of spring and of the self-reliant way of life that has been a crucial component of this region’s history and culture. HUNTSVILLE, Tenn. — The annual Vivian Smith Scott County Looks Good To Me county-wide clean-up will be held Saturday, April 22, 2017. The event begins with registration at 9 a.m. and continues until 12 p.m. Residents are urged to get involved and spend the morning cleaning up a road of their choice within their community. There will be several registration locations throughout Scott County, each of which will be manned by county commissioners. In the 1st District, the registration location will be Fairview School. In the 2nd District, the registration location will be Robbins School. In the 3rd District, the registration location will be the Scott County Office Building. In the 4th District, the registration location will be Helenwood Baptist Church. In the 5th District, the registration locations will be Pine Hill Community Center and Winfield City Hall. In the 6th District, the registration location will be Oneida High School. And, in the 7th District, the registration location will be Burchfield School. A community cookout will follow the clean-up, beginning at 12:30 p.m. at the Scott County Office Building in Huntsville. The cookout is free and prizes will be awarded. The county-wide clean-up is a collaborative effort of the Scott County Mayor’s Office and the Scott County Litter Program, the Scott County Recycling Center, the Scott County Sheriff’s Department, the Scott County Road Department, the Scott County Board of County Commissioners and the Scott County Chamber of Commerce. ONEIDA, Tenn. — The Boys & Girls Club of the Cumberland Plateau will host an antique car show Saturday, April 22, 2017. The show will begin at 9 a.m. and continue until 1 p.m. The registration fee for all automobiles and motorcycles is $10. A free dash plaque will be presented to the first 25 cars, and each registration includes a free pancake breakfast. Admission is free for spectators. There will be a pancake breakfast for $5, and bounce house admission will also be $5. HUNTSVILLE, Tenn. — Flu season is here, with seasonal influenza cases now reported across Tennessee. The Scott County Health Department is working to protect the entire community by providing flu vaccinations at no charge to area residents on a first come, first served basis. A small amount of vaccines is still available and to ensure they can be used to protect health will be provided at no charge to patients until vaccine supplies are depleted. Patients may walk in to request a flu vaccine any time during regular clinic hours or appointments can be made to receive flu vaccine, and are now being scheduled at the clinic. The flu vaccine is especially important for people at high risk for serious illness or death from influenza such as the elderly, pregnant women and young children, as well as healthcare workers and family and friends of anyone at high risk. Expectant mothers should be vaccinated during pregnancy to protect themselves and pass protection on to their unborn babies. Both adults and children may receive the free flu vaccine at the clinic. Call the Scott County Health Department at 663-2445 today to book your appointment. The clinic is located at 344 Court St. in Huntsville and open Monday through Friday, 8 a.m. until 4:30 p.m.
ONEIDA, Tenn. — Scott County’s new hospital will open this spring as Big South Fork Medical Center, it was announced Monday. Rennova Health Inc., the Florida-based company that purchased the hospital facility from Pioneer Health Services, said in a news release Monday morning that the new name is the result of the “Name Your Hospital” community involvement campaign that the company conducted on Facebook. Tony Taylor, administrator of the hospital, said that allowing the community to choose the hospital’s name shows Rennova’s commitment to Scott County. The hospital said there will be several announcements made as the core management team works towards reopening the hospital. While the exact opening date is uncertain, the hospital expects to begin receiving job applications March 1 and will soon announce a web portal for the online application process. 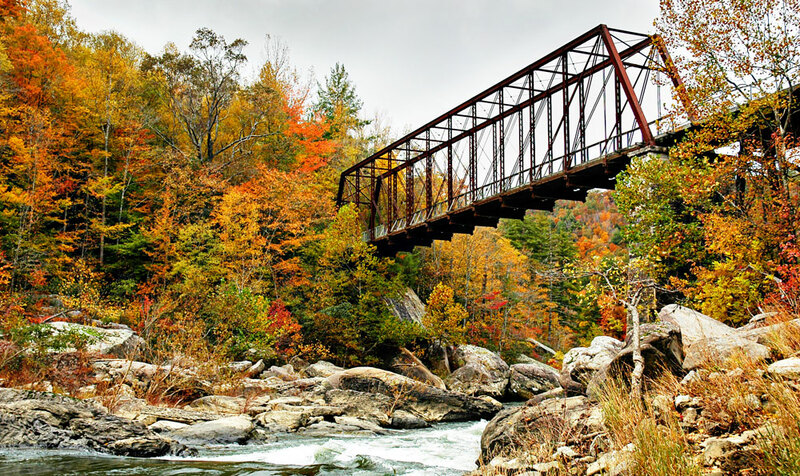 Improvements are coming to the historic O&W Railroad Bridge in the Big South Fork National River & Recreation Area. The Scott County Chamber of Commerce announced in July 2016 that it has received grant funding through a tourism grant to fund a $97,000 project to replace all timbers on the century-old bridge. The grant was facilitated by the Industrial Development Board of Scott County, and supported by the Tourism Committee of the Chamber of Commerce. Work on the bridge was originally expected to begin at the conclusion of the fall tourism season in November. However, an unexpected delay in the release of funding has resulted in the project being delayed.